CornerStone Rack & Tooling has the processing technology and quality control required to build racks for chrome plating parts. CornerStone's equipment incorporates the latest technology and is operated by employees who have been trained in the process of building electroplating racks. Our core staff has over 100 years combined experience in the rack and tooling industry and ensures that quality is maintained throughout the manufacturing process. 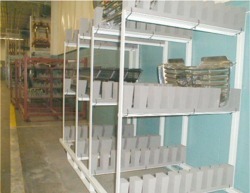 The CornerStone core staff experience is vital in building quality plating racks, especially when the substrate is plastic. The only school that teaches electroplating rack design is the "university of hard knocks", and with over a 100 years of combined experience the core staff at CornerStone are all "graduates". There are a multitude of factors that must be considered when building electroplating racks, and these factors can only be clearly understood through experience. A few of the critical factors are electrical current distribution, drainage, and warpage. CornerStone Rack & Tooling provides fast and reliable service while maintaining a superior level of quality and design in building electroplating racks. 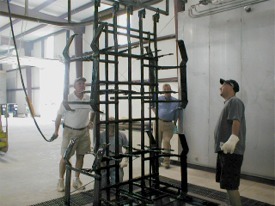 Maintaining quality while building modern electroplating racks requires "state-of-the-art" equipment and training. CornerStone takes pride in maintaining our manufacturing facility with some of the best machinery and processes available in the industry. Our highly technical representatives spend an equal amount of time with our clients and on the CornerStone Rack & Tooling Shop Floor. 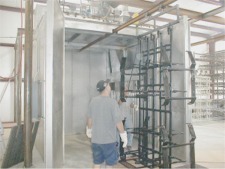 CornerStone Rack & Tooling can build paint racks and fixtures for a variety of finishing operations including powder coating and wet spray. The CornerStone staff have all the knowledge and experience to design racks and fixtures from "scratch" or to improve a design that is not performing to requirements. As manufacturing line speeds and densities increase, part placement and positioning become more critical than ever before. The CornerStone staff have all the design knowledge necessary to implement modern processing equipment to the most exacting standards. Many companies are replacing metal parts with painted plastic parts to reduce weight and cost in products. 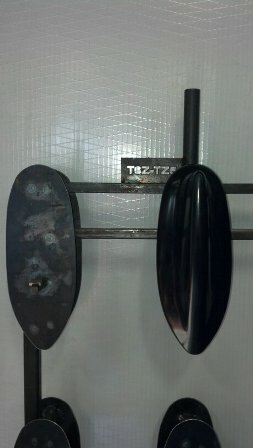 The switch to plastics complicates the rack design and production procedures. Plastics are more sensitive to the factors of warpage, drainage, and spacing than metals. 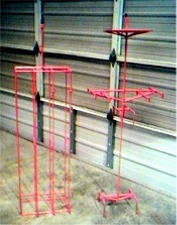 CornerStone can custom design paint racks to the most exacting standards required. Our staff has all the skills and experience necessary to work with your molding personnel to ensure that all of your requirements are covered. On every job, no matter how large or small, CornerStone builds welding and adjustment fixtures to exact standards. So whether you have 1 rack or a 1,000 racks built, CornerStone will build a consistent rack from beginning to end. CornerStone Rack & Tooling can work with customers from the beginning stages of installing a conveyor in the plant to the final stages of production. CornerStone can custom design material- handling equipment for a new manufacturing process or redesign an existing system to achieve greater efficiency. CornerStone Rack & Tooling has the capabilities to put whatever finish is required on the conveyor racks or baskets to help reduce manufacturing defects that can be caused by handling and movement. The conveyor racks and baskets can be finished with a plastisol coating, a painted finish, or a combination of both finishing processes. The CornerStone staff has over a 100 years of combined experience in designing and implementing conveyor racks and baskets for the manufacturing and material-handling industries. For your next project, please contact us for a quote. After careful analysis of the market, CornerStone Rack & Tooling has installed a plastisol coating system with some of the largest work parameters available anywhere in the industry. CornerStone can coat items with dimensions 9 feet long, 4 feet wide and 9 feet in depth with a weight not to exceed 500 pounds. Having a plastisol coating system this large requires careful attention to processing quality, efficiency, and environmental controls. 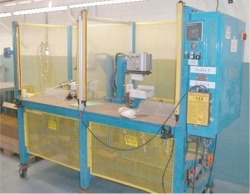 CornerStone Rack & Tooling has carefully addressed all 3 of these requirements. Quality - In order to make certain that our customers receive the finest work possible, CornerStone purchased and installed modern computer controlled ovens to consistently maintain the optimum temperature from load to load. Efficiency - Having equipment this costly requires that the plastisol coating process be highly efficient to prevent an unacceptable price point for our customers. CornerStone has installed a highly efficient monorail system that substitutes having to "manhandle" the items to be coated. Our staff contributed their vast amount of combined experience in the implementation of the CornerStone plastisol coating system. Environmental Controls - CornerStone Rack & Tooling spared no expense in implementing one of the most environmentally compliant systems in the industry. CornerStone takes great pride in the responsible protection of our environment. CornerStone Rack & Tooling has the capabilities to provide all the tooling required to implement any industrial part's process from molding through surface finishing to the installation of the part on the finished product such as an automobile. We can create all of the tooling machines to meet the most demanding industry requirements. CornerStone Rack & Tooling has experience designing and building degating machines that can cut off all molding runners and plating tabs, as well as trimming flashing on all plastic parts, both before and after the plating process. 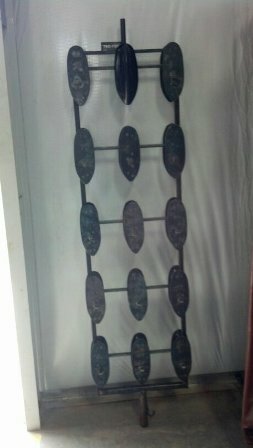 We have experience with machines that can put metal clips on assembly tabs to ensure proper installation. We also have experience with assembly and press machines that can automatically assemble multiple parts that must fit precisely. These machines can prevent improper alignment and notify an operator that a part is not within specifications. CornerStone Rack & Tooling uses name brand components on all machine tooling projects to ensure high quality machinery for industry. We can build all types of machined tool surface finishing and material-handling tools, as well as most robotic machinery. CornerStone Rack & Tooling provides operator manuals, parts lists, and wiring diagrams for every machine, so that maintenance personnel will have all the reference material required for troubleshooting and maintenance. For all surface finishing and material handling projects, CornerStone Rack & Tooling is prepared to meet the most demanding requirements of the industry. CornerStone Rack & Tooling LLC can provide all the design and layout services for surface finishing and material- handling projects. CornerStone Rack and Tooling is a one-stop shop that can work from industry part descriptions and line specifications to complete all the design services required to complete any surface finishing and material-handling project. CornerStone's core staff has a combined experience of 105 years in implementing projects for our clients. As a one-stop shop, CornerStone Rack & Tooling can provide all the design services required for the most demanding surface finishing and material- handling projects. For your demanding projects, ask us for a quote. You don't have anything to lose but a headache.